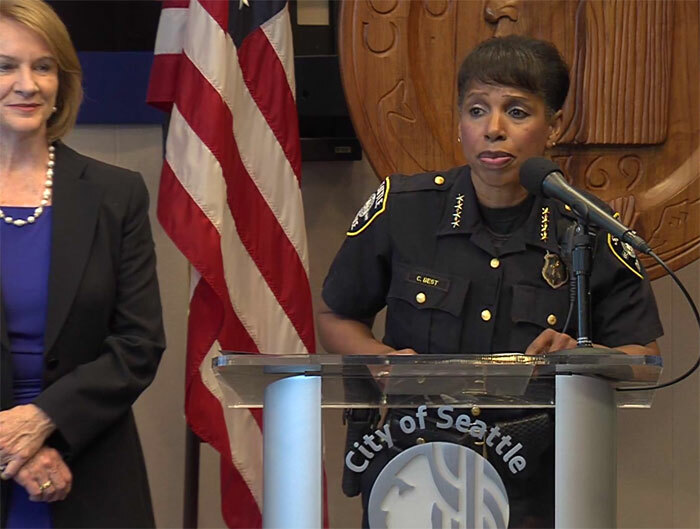 Image courtesy of SeattleChannel: Mayor Jenny Durkan announced her nomination of Carmen Best for Seattle Police chief during a press conference on Tuesday, July 17. Mayor Jenny Durkan declared her nomination of Carmen Best to lead the Seattle Police Department on Tuesday, praising the 26-year veteran who had initially been kept off the list of candidate finalists. Best has been serving as interim chief since the beginning of 2018, the mayor tapping her for the position after Kathleen O’Toole announced her resignation back in December. A 25-member search committee was convened to go over viable applicants, and had selected five finalists that included Best. A number of committee and community members protested when they found out those candidates were whittled down to three finalists, who were announced on May 25 and didn’t include Best. The mayor’s office reported on July 7 that Best had been tapped to replace Cameron McLay as a finalist, after the former Pittsburgh police chief withdrew his name from consideration. Durkan said at that time that she had spoken with McLay about taking on another position with SPD that addressed police reforms. Durkan said during a July 17 press conference that she and Best would sit down with McLay to figure out what that role might look like. Durkan said she wanted to clarify that there will be just one police chief in Seattle, and that will be Best, pending her confirmation by the city council. District 9 Councilmember and chair of the Gender Equity, Safe Communities, New Americans & Education Committee Lorena González will oversee the confirmation process, which will start with a committee briefing and discussion 9:30 a.m. Wednesday, Aug. 1. A special committee public hearing will then be held at 6 p.m. that day in council chambers, followed by a possible committee vote on Aug. 8. If the committee votes to approve the appointment, the full city council would take final action at 2 p.m. Tuesday, Sept. 4. Durkan’s decision followed a series of seven community meetings with the police chief finalists, including conversations with the Community Police Commission, Seattle Police Officers Guild, the city attorney, federal monitor under Seattle’s 2012 consent decree and people impacted by police violence, the mayor said. Federal Judge James Robart in January ruled SPD in full and effective compliance with a 2012 consent decree the city entered with the Justice Department after it found issues with excessive force and biased policing. SPD must sustain those reforms for two years under the second phase of the decree. Best said what’s needed is increased access to resources for those suffering from mental health crises, addiction and homelessness. She also highlighted the new use of force policies and training implemented by SPD. She said the work is far from done, and she will push the department to make even greater strides in police reform and securing the community’s trust as the next police chief.